“wash hands!”, she seemed quite pleased. time to add another layer to that. she tries homemade cookies and good chocolate first. when she tastes the bliss that is chocolate. before feeding her anything for the first time. blood refusing chocolate, I stick to things more familiar. and raisins if you’re using them, and stir. stir making sure any additional sugar dissolves. Serve warm. try chocolate (for bizarre reasons known only to themselves). refusing the chocolate because of its color. brown square can look a tad dubious. mama is not going to mention in her food blog. This was so lovely to read 🙂 How time has flown, she's going to "school" already!! A wonderful breakfast pudding! i love this variety of rice. Hooray for Little C's exciting year! You couldn't have picked a better school for her. Thanks for posting the rice pudding recipe – I've been craving for that, or semolina pudding, for a while now! I am also guessing the brown color did not appeal to hear 🙂 But sooner or later, she will get to taste chocolate and will love it like we do! What a cute story, Joey! It will be a wonderful year for you, I bet. Love this purple rice pudding! Too bad I couldn't bring some back here. Next time, I have to make this over there in Manila. Thanks for sharing! Hi Betty Ann! Looking forward to this year and all the adventure it will surely bring 🙂 Yes, you must try this next time! This looks very yummy and healthy. Since I don't have access to purple rice, what other types of rice may I use for this recipe? I will never say no to anything you offer me! I'm with you with the no-sugar beforehand. I'm not a mother but I somehow feel strongly about that idea. Hi Shalum! She like stuff like this and oatmeal…I love champorado! I'm sure you know I'd be in the camp that's aghast at a two-year-old never having sugar! 😉 A friend of mine didn't let her son taste sugar until he turned one, and then he got a bite or two of carrot cupcake. You can imagine my reaction: "You wait a year to give him sugar, and you give him a *carrot* cupcake?! HAHAHA! My family prides ourselves in our love for sweets, so there's no way we could do that. Don't get me wrong, though. I totally support what you did. In fact, I'm also uncomfortable with giving kids sweets too often. Most people are born with a natural preference for sweet food, so I like the idea of getting her into the other flavors first. My new niece's pediatrician recommended she be given sugar water in her bottle to help her gain weight (she was premature), and I don't like the idea that she's already ingesting refined sugar this early; not to mention, it may permanently set her taste preference for sweets. I'm curious, though: since you do bake desserts once in a while, how did you keep her from wanting to eat them? Hi Katrina! It was actually quite easy and happened fairly naturally 🙂 C hardly has any sweets so we don't have them lying around the house often. When I bake, or have desserts, I just don't offer her any and, so far, it's never been a problem. Sweets will definitely be a part of her life (as it is a part of mine) but I just wanted her to have a good foundation of different flavors before having any. One of the things I enjoy most about having a child is the pure, uninitiated palate they have that I can form (or try to influence at least)! It is magical seeing someone experience different food for the first time! 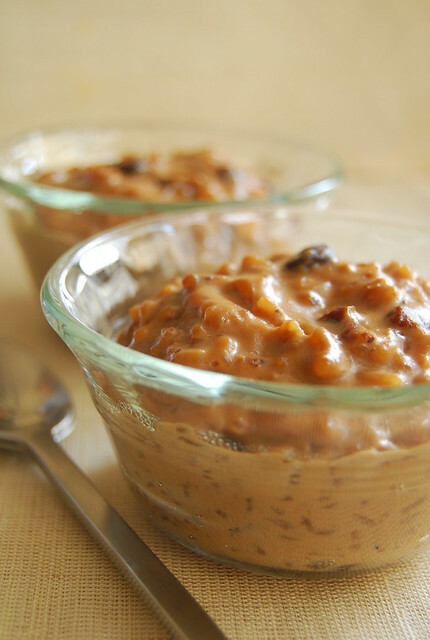 Rice pudding is so easy to make! And you can make small portions, like oatmeal almost 🙂 We also eat this purple rice plain…love it!